It’s hard to believe that Gizmo is no longer with us, for he is the reason that the Primate Rescue Center came into existence. In 1987, Clay Miller purchased Gizmo, a young long-tailed macaque from an animal dealer for his future wife April Truitt. It quickly became apparent that their energetic pet would enjoy a companion, but it was during their search for another monkey that Truitt and Miller discovered a surprising number of primate pets requiring forever homes. 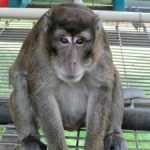 As they took in more and more individuals requiring lifetime care, the Primate Rescue Center was developed so that Gizmo and his companions could be properly cared for. Giz, as he was known, affectionately responded to humans but was very protective of his home and female companions, rescued former pets Ciera and Bubbles. Sweet and laid-back, he was always eager to lip-smack at the humans passing by. Gizmo was a beloved friend to all at the PRC, and his legacy will live on through the sanctuary that he was a part of founding.